You’ve tried everything to get rid of your neck pain: physical therapy, chiropractors, cortisone shots, prescription pain pills — you name it, you’ve done it. So why does your neck still feel like it’s stuck in a vise that’s being turned tighter and tighter? Notice that all of the tactics you’ve tried focus on the physical. But what if we told you that while these physical fixes are important steps to ditching neck pain, you’re missing what can be one of the biggest contributors to the pain... your mind? Here’s where we tell you that your neck pain is at least partly in your head. Not that you’re imagining it — though some doctors have probably told you that when they couldn’t figure out the problem — but that your mind and emotions can be keeping you stuck in pain. In my Lose the Neck Pain program, I detail the mind-over-matter cures for neck pain. But I wanted to share some of my findings here so you can take the first steps to ditching the hurt for good. Sometimes it’s not what you do to relieve neck pain, but what you don’t do. By that I mean you need to take frequent breaks from the busyness of everyday life to rest and relax — and reduce the painful muscle tension that builds up during a stressful day. – Meditation: Closing your eyes and simply focusing on the breath can help you put your pain in perspective, as well as relax painful muscles. Need help getting into the zone? The Meditation Podcast offers free guided meditations that you can download to your MP3 player. – Sleep: Be sure to log enough sleep during the night that you feel well rested; for most people, this is between 6 and 9 hours. Tiredness can make neck pain seem even worse than it is, and can exacerbate tight muscles in the neck. If you have problems sleeping, don’t miss our 15 Essential Tips for Better Sleep. – Self-hypnosis: To perform self-hypnosis you’ll enter a deep state of relaxation and then use self-suggestion techniques such as affirmations to reduce pain and achieve positive changes in your life. You can find instructions on how to perform self-hypnosis at Mind Tools. And if you don’t want to go it alone, you can visit a hypnosis practitioner who will walk you through the process. Too many people make the mistake of dealing with their neck pain without a plan. It hurts, they put on an ice pack. It hurts again the next day, and they call their doctor. But like anything else in life, banishing neck pain requires you to set goals for getting out of pain and getting your life back — and then to develop a plan that will help you reach those goals. I go into detail on goal setting in Lose the Neck Pain, but I’d like to share an important aspect of goal-setting that will help you become pain-free: That is, an inspiring goal should be SMART: Specific, Measurable, Attainable, Relevant and Timely. Specific: It’s hard to be motivated by a vague goal like “I want to feel better.” So be specific: Do you want to be able to play an hour’s worth of tennis without pain? Do you want your pain to go from a 9 on the pain scale to a 2? Measurable: If you can measure a goal, you’ll know when you’ve achieved it. The goals we mentioned — being able to play tennis for an hour or reducing pain from a 9 to a 2 — work because you can measure them. Relevant: Set goals that mean something to you personally. How does reducing neck pain tie into your life values and passions? For example, if being there for your grandkids is one of your life values, getting rid of neck pain so you can play with them is a relevant goal. Timely: Putting time limits on your goals, instead of saying you’ll achieve them “someday,” will give you something concrete to strive for. John E. Sarno, MD, a Professor of Clinical Rehabilitation Medicine at New York University School of Medicine and author of The Divided Mind: The Epidemic of Mindbody Disorders, coined the term Tension Myositis Syndrome (TMS) — a condition characterized by pain that seems to have no physical cause, especially in the upper neck, back, and shoulders. In plain English, that means your neck pain can be caused by your mental state. TMS experts advise that pain-sufferers write out the issues that might be a source of repressed emotions that can lead to pain — and they also recommend education in the psychological and physical aspects of TMS. This education can include empowering written and audio materials like my Lose the Neck Pain program, which offers both types of materials to help neck pain sufferers no matter what their learning style is. I know: It’s hard to keep a positive, relaxed outlook when your neck is killing you. But if you let yourself become overwhelmed with negative feelings and stress, it can keep you from healing the pain. – They create tight muscles that lead to painful muscle imbalances. Consider this popular saying: If think you can’t, you’re right; but if you believe you can, you will!” In other words, if you despair that your neck pain will never go away, you’re creating the very conditions that make that thought true. But if you achieve a positive outlook — your neck pain will go away! — you’ll naturally take steps to make it be so. I discuss the effects of mindset on neck pain in some detail in Lose the Neck Pain. You can also learn how to beat the stress that keeps you in pain with the tips in my blog post My Top 10 Easy Stress Busters. 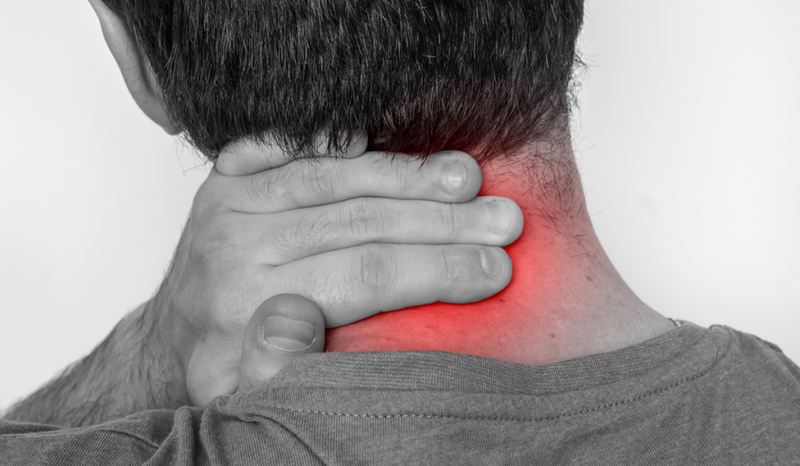 Use Lose the Neck Pain for the Fastest, Simplest Ways to Permanent Relief! The Lose the Neck Pain program tells you what your doctor and physical therapist won’t: the simple tactics — both physical and mental — you can do on your own, in a few minutes per day, to ease the pain. I believe in a whole-body approach to pain relief, so you’ll get my specific health and mindset tips to help you not only reduce your pain, but also reduce your weight and improve your overall health and fitness in every area. Yes, it’ll take a few minutes a day — what worthwhile things have you ever accomplished without some kind of effort? — but everything you need to do is simple and easily done right from the comfort of your own home. My thorough Lose the Neck Pain package consists of 1 DVD, 3 audios, a reference manual, and 90 days of personal support — plus many more bonuses. What else you get: No long car drives to the doctor or chiropractor, no expensive pain medications — and no more pain! Super program, the highest quality of products on the market – I love Lose the (pain). Whiplash injury, plus a shoulder that was “asleep” for years that I wasn’t aware of. the neck pain and on my own for therapy. and believe in every product and program they have. Will lose nothing and gain your life back. I am forever greatful. Just received my Losethebackpain system by mail today, thanks very much. I am wondering if the losetheneckpain system is necessary especially if I might decide to buy your inversion table. Would it not be double or triple system for the same goal? Thanks for your help to make my decision. That said, the Inversion table is an great took for both, Upper and lower spine and works will with our system. My main sources of neck pain are I believe from performing 2 recurrent routine activities,namely sleeping at night and working on the computer,especially the latter. An an oldtimer my typing skills are very basic, namely using one finger which forces me to crouch over the keyboard with my neck drooping down and unintentionally dozing off at times with my neck dangling loosely. Will this program help with cervical spondylosis with myelopathy. I’m trying to stay away from having surgery. Besides the Heal and Soothe, are there any other natural pain relievers that you would recommend as I am allergic to pineapple?